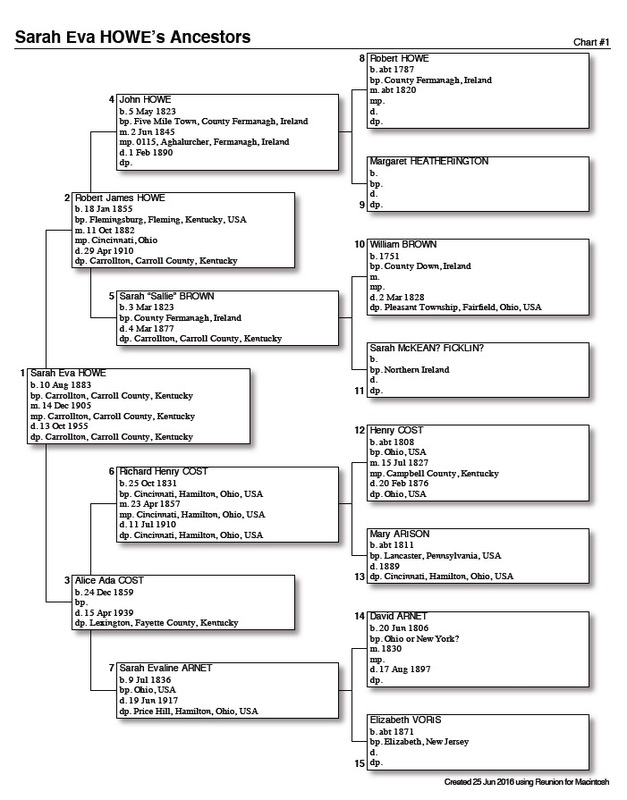 I assembled this chart based on information provided by a Howe descendant, Richard Allen Hays, Jr., plus information gleaned from Sarah Eva Howe's scrapbooks. I have documentation for some facts but not for all. Please consider the chart a starting point in your research, not as proof. If you have a question about any name, date, or place, please comment or send me an email message (kykinsearcher@gmail.com). I will respond and gladly share the sources I have. Question marks indicate my own uncertainty. This is a work in progress. I welcome corrections and help with filling in the blanks. Dear Viewers: Since posting this chart, I have discovered in one of the scrapbooks Sarah's commentary about the death of her great-grandfather David ARNET. Her comments, plus a cemetery record, indicates that David Arnet died either in the last few days of 1896 or the first few days of 1897 -- not on 17 August 1897 as indicated. I will correct the chart as soon as I analyze and confirm.